Han Lu, 45, a businessman in the auto industry who travels frequently, is looking forward to Beijing Daxing International Airport opening－which is scheduled for Sept 30－because he lives in the south of the city. "I usually spend more than one and a half hours getting to Beijing Capital International Airport from home. Hopefully, the new airport will save me an hour on the road," he said. On the other hand, Wang Liu, 36, a marketing director whose company has headquarters in Shanghai, is worried that it may take her much longer to get to the new airport from her home in the northwest of Beijing. "I fly to Shanghai four times a month on average, sometimes even more. China Eastern Airlines, whose flights I take most of the time, will move to the new airport, which probably means I will have to spend much more time getting there," she said. "It will be a problem for me." 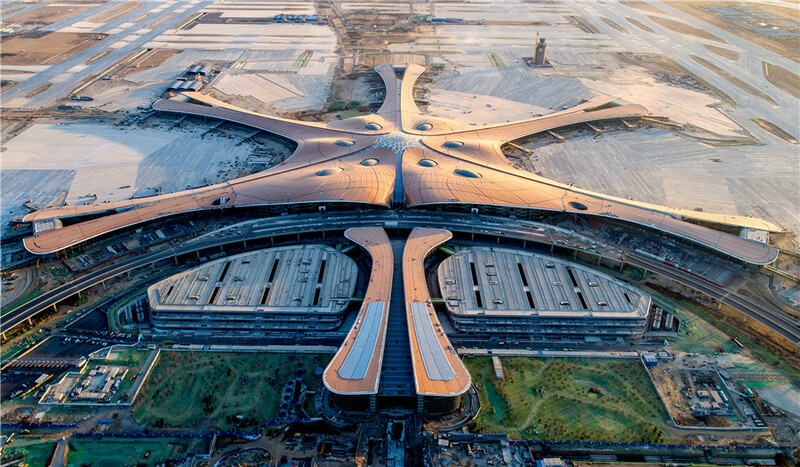 Beijing Daxing International Airport, an 80 billion yuan ($11.6 billion) project, will affect or even change people's lives, including those of travelers from all over the world, Beijing residents, airline employees and people living in nearby areas such as Tianjin and Hebei province. The airport, which will be the largest in the world when completed, will contribute to the global air transportation network and economic growth in Beijing's southern districts as well as nearby regions. It will also produce business opportunities for both domestic and foreign airlines, according to a government official and industry experts. Cui Xiaohao, deputy head of the Beijing Commission of Development and Reform and deputy director of the new airport's office, said the facility is the key project for Beijing this year and will enable the capital to serve as the country's international communications, cultural, political and scientific innovation center. "More than 100 million passengers used Beijing Capital International Airport last year, which is close to its capacity," Cui said. "The new airport will ease pressure on the existing one, giving it a chance to improve its facilities and service." The Civil Aviation Administration of China predicts that the number of passengers using Beijing's airports annually will reach 150 million by 2025. The new airport is designed to handle 45 million passengers annually by 2021 and 72 million by 2025. There are long-term plans to expand the number to 100 million, according to CAAC. Cui said: "That will further improve Beijing's role as the international communications center of China by creating better airport conditions and airline services. The new airport will help balance Beijing's economic growth between the northern and southern areas of the city." The northern areas have long been considered to be more developed than those in the south. There are more universities, high-tech companies and research institutions in northern Beijing, while southern districts are home to clothing wholesale outlets, buildings material markets, factories and farmland. Daxing district was selected as the site for the new airport to help accelerate the industrial transformation of the area, Cui said. "The new airport will bring talent, related businesses and services to southern areas, which will boost the local economy," he added. Li Lei, a principal with the Roland Berger consultancy in Shanghai, said the new airport will help drive the coordinated development of Beijing, Tianjin and Hebei. It also has advantages in meeting the demands of the Xiongan New Area, whose main function is to serve as a development hub for these three regions. The new airport, which is expected to become North China's air travel hub, is situated on the border of Beijing and Langfang, Hebei. It is 46 kilometers from Tian'anmen Square, 26 km from downtown Langfang, 55 km from the Xiongan New Area and 67 km from Beijing Capital International Airport. Given the strong regional transportation network between Beijing, Tianjin and Hebei, travelers landing at the new airport will be able to reach downtown Beijing, the city's government sub-center in Tongzhou district and the Xiongan New Area within half an hour. They can also reach nearby cities including Shijiazhuang, Tangshan and Baoding in Hebei, along with Tianjin, within an hour of landing, according to the new airport's office. Li said, "The new airport is farther from the downtown area than Beijing Capital International Airport, and there will be some disadvantages for it to attract business travelers in the initial stages of operations. "However, a number of State-owned enterprises in Beijing plan to move to the Xiongan New Area, and the new airport is predicted to attract more travelers who take business trips from this area to other regions." Completion of the new project will bring business opportunities to the two major Beijing airports and airlines－including those staying at the existing airport and those moving to the new one. "Cooperation between the two airports is greater than their competition, and they will complement each other," Li said. On Jan 3, CAAC said the new airport is designed as a large international aviation hub, the new growth driver for the nation's development and a comprehensive transportation hub for the integrated development of Beijing, Tianjin and Hebei. Meanwhile, Beijing Capital International Airport will take on the role of an international aviation hub for the Asia-Pacific region. Cui, the deputy director, said, "Different from the two airports in Shanghai, where one is mainly for domestic airlines and the other mostly for international carriers, the two in Beijing will both be international." He said this arrangement, added with the airports in Tianjin and Shijiazhuang, capital of Hebei, will form a world-class airport complex in the Beijing-Tianjin-Hebei cluster. Tianjin airport will become the international airfreight center for North China and a regional hub, while the one in Shijiazhuang will be developed into a hub for budget airlines and an air courier center. CAAC also announced plans for the relocation of airlines. Carriers including China Southern, China Eastern, Beijing Capital Airlines and China United Airlines will move to the new facility, while others such as Air China, Hainan Airlines and Grand China Air will remain at Beijing Capital International Airport. Foreign airlines, along with those from Hong Kong, Macao and Taiwan, can choose which airport they operate from, with the option of having a presence at both. Chinese carriers, except China Postal Airlines, will have to use just one airport. The phased transition will start from next winter and be completed over 12 months, CAAC said. Li, at Roland Berger, said, "In the initial period of operation, the revenue of airlines that move to the new airport may be affected. Take China Eastern, for example－its most profitable flights are those operating between Beijing and Shanghai, and the carrier may lose some business travelers after the move. "However, with the improvement in services and better infrastructure at the new airport, such losses will gradually be recovered. The new airport can also attract more passengers by introducing better shopping experiences and smart devices." Huang Pu, general manager of China Eastern's planning and coordination division in Beijing, sees the move to the new airport as a great opportunity for the company to make the capital its most important market outside of its Shanghai headquarters. "We have detailed plans to expand our network and invest in the support project at the new airport," he said. As a foreign airline with the right to choose its operating location in Beijing, Air France KLM plans to move to the new airport. Toon Balm, general manager of Air France KLM China, said many people fly from Europe to Beijing, but they do not stop in the city, and continue their journeys on flights operated by the carrier's Chinese partners. "China Eastern, China Southern and many other airlines in the Sky-Team Airline Alliance will move to the new airport, so we will follow," he said. Balm said Air France KLM hopes the new airport will bring additional traffic, and from a commercial perspective that business can grow. He added that the carrier needs to be very flexible with its aircraft, network, slots and customers. He said moving to the new airport is a challenge, but from a business perspective it is very interesting. American Airlines, the largest carrier by fleet size, said it is considering opportunities for increased connectivity with China Southern, including moving with the carrier to the new airport. However, a final decision has not been made. In 2017, American Airlines made a $200 million equity investment in China Southern, creating a foundation for their long-term partnership. Code sharing and interline agreements between the two carriers give customers of both access to many more destinations in China, as well as North and South America, the US airline said. Anthony Flynn, communications manager for Asia-Pacific at American Airlines, said: "In November, American Airlines and China Southern took steps to further strengthen our partnership with a significant expansion of code-sharing cooperation and the launch of reciprocal frequent flyer benefits and lounge access. These benefits are due to come online this year. "China and the United States are the two biggest air travel markets in the world, with growth forecast in the business and leisure sectors. With the opening of Beijing Daxing International Airport in 2019 and the ability to cooperate fully with China Southern, American Airlines is excited about its future in the Chinese market." According to the office at the new airport, 80 percent of the interior construction has been completed and all the external work is finished. The water supply pipeline network and electricity transformer substations are ready, while a natural gas pipeline will soon be in use. Green and energy-saving concepts were adopted for the airport's design and construction. Passengers will spend a maximum of eight minutes getting from the center of the terminal to the farthest boarding gate, about one-third the time spent at Beijing Capital International Airport, according to the office. Renewable energy will comprise more than 10 percent of the new airport's energy consumption mix when construction is completed. This will rank it No 1 in terms of the renewable energy adoption level at airports nationwide, according to the Beijing Municipal Commission of Development and Reform. Photovoltaic solar energy panels have been fitted on roofs of the parking lots and business jets hangar, while geothermal energy will be used in the airport's service facilities. The solar energy generation system will provide 6.1 million kilowatt-hours annually for the new facility, accounting for 1 percent of total energy consumption. Traditional power plants and natural gas will also supply energy to the site. A comprehensive network will help travelers reach Beijing districts or nearby cities, and it is forecast that more than 50 percent of them will use public transportation at the new airport.